Almost every Sunday growing up we had family dinner's. My grandma would always bring over pastries. Among these pastries were bismarcks. 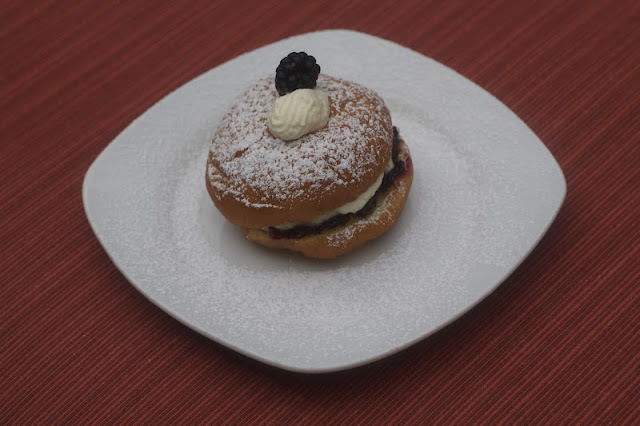 A bismarck is essentially a donut filled with jelly and whipped cream. In a saucepan simmer milk, sugar and boil. Take it off the heat and wait until the milk is luke warm. Then add the yeast and temper in the egg yolks. Whisk this mixture together. Then slowly add it to the flour and mix with your hands. The dough will be very sticky but it is okay. Just let it rise for 2 hours in a oven. Make sure your oven is off! The dough will double in size. If the dough is sticky knead in extra flour. Flatten the dough out on a floured surface with your hands to about 3/4-1/2 inch thickness. Cut them into even discs using the lip of a cup. Let them rest. In a metal sauce pan fill it up with oil about half way. Heat up the oil until you thermometer reads around 350 degrees. You can test your oil by throwing in a pinch of flour, if the oil sizzles then you are ready to fry! Fry the dough in batches and don't over crowd the pan. Cook for about 1-3 mins on each side or until they are golden brown. Take them out with a slotted spoon and let them drain on paper towels. Once they are cooled slice them through the middle with a serrated knife. 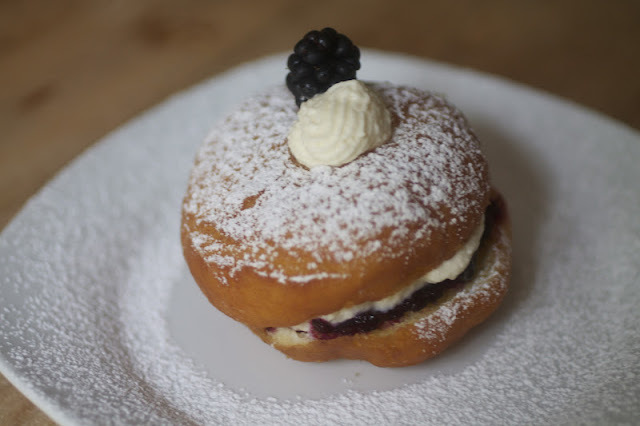 Fill them with has much piped whipped cream and jam as you like. Top them with powdered sugar. Put it all together in a saucepan on medium heat. Mash up the fruit with the back of your spoon. Let the jam cook stirring occasionally until the sauce has reduced and the mixture thickens. Take it off eat and let it rest. The jam will thicken further. Whip your cream. My cream was so fresh that it didn't need sugar, but add it if you want it.